KVS Admissions Class 2 Registrations Start from April 2: How to fill KVS Admissions Class 2 Online Application Form. How to fill KVS Admissions Class 2 Registration Form. How to Apply for KVS Class 2 Admissions, Submit Online application form till April 9. The admission process in Kendriya Vidyalaya from Class II to IX will begin from April 2, 2019. However, the application process for admission in Class XI will begin only after the declaration of the Central Board of Secondary Education (CBSE) Class X results. Kendriya Vidyalaya Sangathan will close down the offline application process for Class 2 to Class 11 admission for the year 2019-20. Parents who still have not registered their child for the KVS Admission 2019-20 for Class 2 to Class 11 can do it by visiting the nearest KVS. The registration process will be through offline mode and not online. The process of registration commenced on April 2, 2019, for admissions. The offline application submission process will end on April 10 at 4 pm. 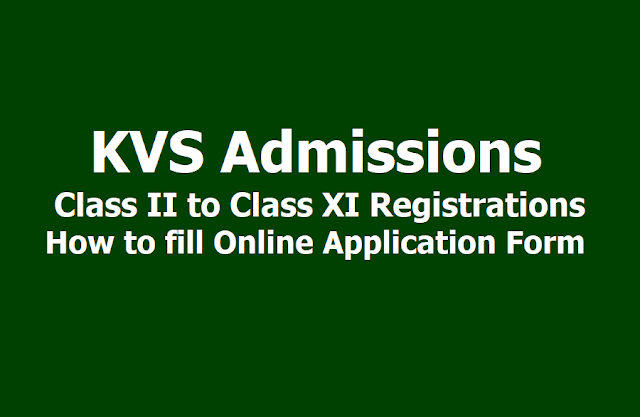 KVS has issued a notice regarding the registration process for admission from Class 2 to Class 11. As per the official circular, the admission process for Class 11 will start after the Class 10 results are out. The result for Class 2 admission will be declared on April 12, 2019. As per reports, the admission process for Class II admission will be conducted from April 12 to April 20, 2019. The documents needed for the registration process are- a digital photograph of the child seeking for admission, scanned copy of child’s birth certificate, details of government certificate for EWS category. There are around 1200 KVs in the country and around 25% of seats are reserved for children belonging to economically weaker section and socially backward families under the Right to Education (RTE) Act, 2009. For more related details, candidates can check the official notice given above. Class 2 to Class 10 KVS admissions 2019-2020: The last date to send applications for admission to class 2 and above (barring class 11) in the Kendriya Vidyalayas (KVs) is April 9, 2019. Interested candidates can apply at kvsonline admission.in. The Kendriya Vidyalaya Sangathan (KVS) has already released merit list for admissions to class 1 and the list for admission to class 2 to class 10 will release on April 12, 2019. The admission will begin from April 12 to April 20, 2019. The calculation of age for admission will be as on March 31, 2019. The maximum age limit can be relaxed by two years in case of differently-abled children, according to the official notification. f. Transfer details of parent/grandparent whose service credentials will be used in the application. The students who are interested in taking admissions in KVs, can apply online through the official KV admission website - kvsonlineadmission.in. The online application process will start from 08:00 am and to continue up to 04:00 pm on April 9, 2019. The admission list for Class 2 onward will be declared on April 12, 2019. Candidates, whose name will appear in the list, can complete the admission formalities from April 12 to April 20, 2019. Candidates should note that the admission process for Class 2 onward would close on April 30, 2019. It may be noted that the KVS had last week released the first list for admission in Class I. The list was released on the official website of the concerned Kendriya Vidyalaya or the same has also been posted on the notice boards of the schools. There is a total of 1137 Kendriya Vidalayas across the country. The students will be shortlisted as per the priority category. Various Kendriya Vidyalayas (KVs) across the country have released the first list of Class 1 KVs admission on the respective websites.